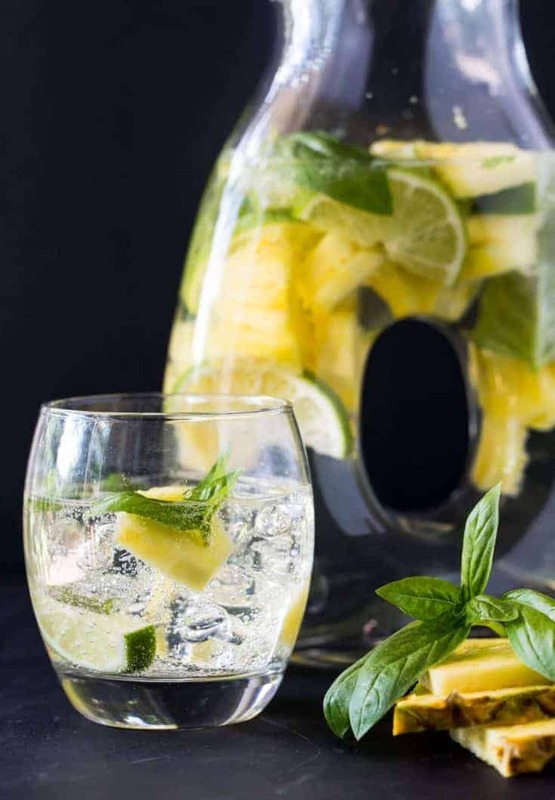 This easy Pineapple Sangria recipe is the ultimate thirst-quencher on a hot summer day. This batch cocktail is made in advance with only 6 ingredients – perfect for parties! If you need me, I’ll be laying by the pool with a glass of this uber-refreshing Pineapple Sangria. Trust me friends, pin, bookmark or print this easy Pineapple Sangria recipe because you will want to have it on repeat all summer long. With only 6 ingredients, this sangria couldn’t be easier to pull together, but it is key that you use Vinho Verde wine in this recipe. What is Vinho Verde? It’s an easy-drinking, low-alcohol white wine from Portugal that typically has a little bit of effervescence to it. Most Vinho Verde wines are young which means they are really affordable. In fact, the bottle I used for this easy Pineapple Sangria recipe retailed for $9. Those bitty bubbles in the Vinho Verde wine are the perfect pick me up on a hot summer day, especially when paired with some tropical pineapple rum, tangy limes, a bit of simple syrup and juicy, fresh pineapple. The last ingredient, fresh basil, is also a must. Infusing the Pineapple Sangria with the basil gives it just a hint of herbal flavor that adds lovely dimension to the cocktail. Don’t skip it! Tip: No need to break the bank on a high priced rum here. 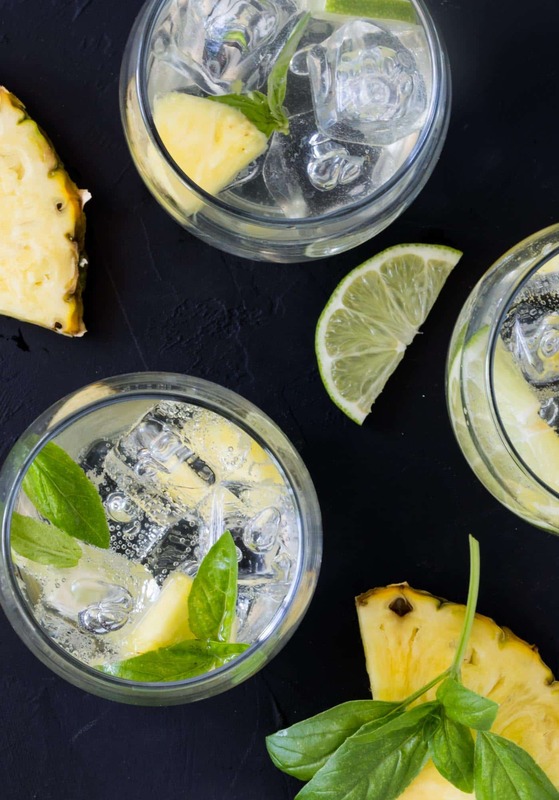 In fact, a pineapple rum with a higher alcohol by volume (ABV) – and typically a higher price tag – will change the flavor of the drink. A pineapple rum with about a 20% ABV is all you need for this Pineapple Sangria. Having guests for a BBQ? 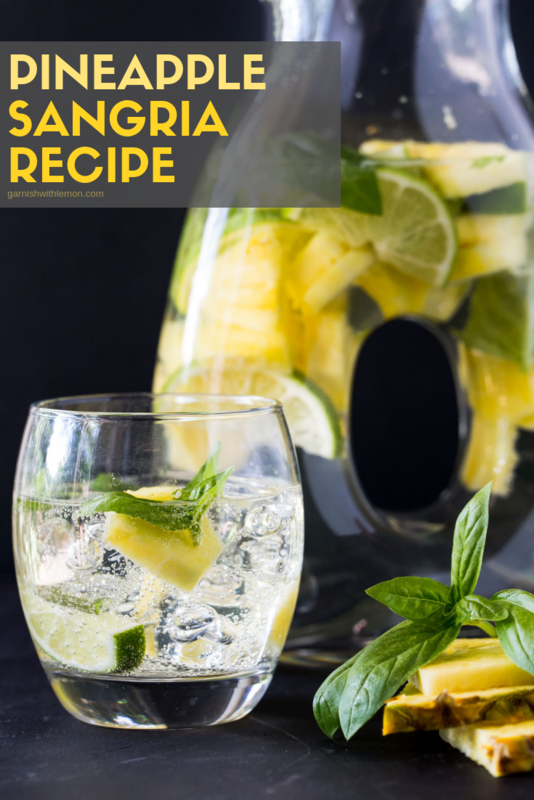 This Pineapple Sangria recipe can be made the day before your party so the flavors can meld overnight in the fridge. Or stir up a pitcher for your next heatwave. We won’t judge if you don’t share. Any sangria fans out there? We’ve got more sangria recipes just for you! This easy sipper is perfect for parties! Place all ingredients in a large pitcher and stir to combine. Cover and refrigerate overnight. Stir before serving over ice. Can’t wait to make this! I love Vino Verde wine! Hi Debra, Simple syrup is one part sugar and one part water that has been cooked on the stove until the sugar is dissolved. Super easy (and inexpensive) to make, but you can also purchase it at the liquor store if you’re short on time. Enjoy!